NASA’s Distance Learning Network (DLN) will present the two-week series Monday, Feb. 24, through Monday, March 10, and will give educators and students from kindergarten through 12th grade the opportunity to learn how NASA and science, technology, engineering and mathematics (STEM) play a role in sports. The DLN is an interactive videoconferencing network that allows the next generation of explorers to connect with NASA scientists, engineers and researchers without leaving the classroom. The distance-learning events are designed to educate through demonstrations and live interactions with NASA experts across the country. 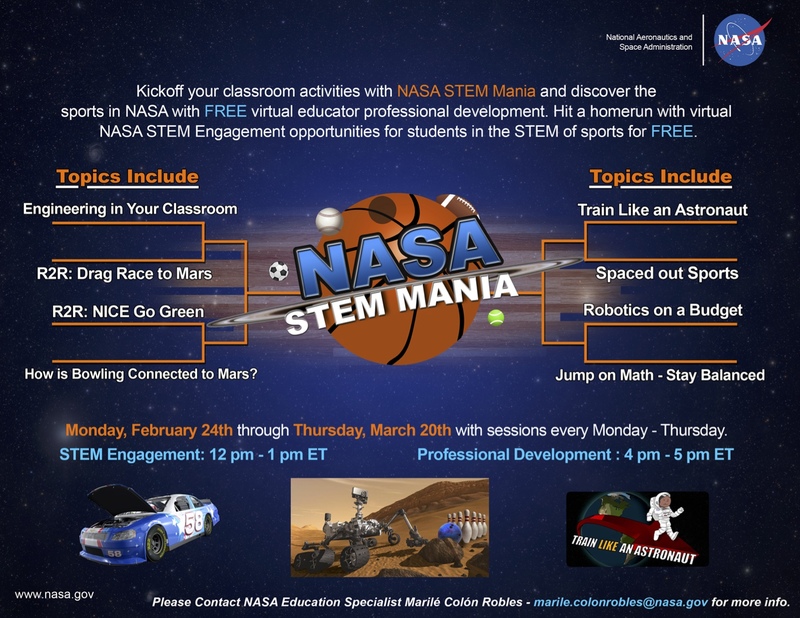 NASA STEM Mania sessions will be held each Monday through Thursday and will allow students and educators the ability to interact virtually with NASA subject matter experts on a variety of topics such as the science of race car driving, using STEM to succeed in football, and using basketball as an engineering example in the classroom. Sample highlights from the various sessions include: sports clips from the International Space Station; a special astronaut appearance; and, how to become an Orion virtual crew member. Thursday, Mar 13th: How is Bowling Connected to Mars? Wednesday, Mar 19th: Mass vs. Weight: What’s the Big Difference Anyway? NASA’s Digital Learning Network provides science, technology, engineering, and mathematics (STEM) instruction from all 10 field centers featuring NASA missions and research. Register for free, interactive events listed in the catalog, or watch the DLiNfo Webcast Channel.